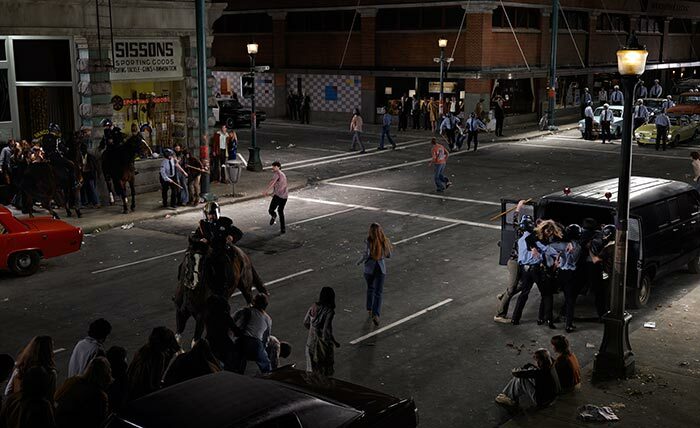 In this essay I will critically analyse Stan Douglas' large public photograph, Abbott & Cordova, 7 August 1971. The process of investigation will primarily make use of texts in Art History, Philosophy and Sociology to produce a suitable theoretical framework for analysing Abbott & Cordova. Using multiple theoretical frameworks to unpack the meaning and signifying strategies found in the work as well as the nature of the work's inclusion in the Woodward's II development is essential to answering the many questions that arise when viewing and contemplating the photograph within its current socio-political and physical location. This essay will lean heavily on the work of Guy Debord's Society of the Spectacle, Jean Baudrillard's Simulacra and Simulation, and Herbert Marcuse's concepts of aesthetics and form that he developed in The Aesthetic Dimension. As this essay is essentially an attempt at analysing a work of visual art, it would seem appropriate to begin the analysis with a close reading of the object itself, therefore, Part I of this project will begin with a formal analysis. Among other things, the formal analysis will attempt to situate the piece within Stan Douglas’ overall practice as well as connecting the visuals of this particular piece to both his stated motives and my interpretive framework. Before this project began to take its current shape, I was fortunate enough to be introduced to the work of Yve-Alain Bois, particularly his book, Painting as Model. His thoughts regarding a return to the object became very influential; he informed the way I am tackling this project. As this attempt to understand and find meaning in a contemporary photograph is challenging, multi-disciplinary and heavily driven by theory, I thought a return to the object could be very useful in aiding me in this process. Bois' championing of multi-theoretical approaches to visual art and his belief in the necessity of a close reading of the work itself, including a new-formalist approach driven by a rigorous visual analysis influenced immensely how I would move forward with this project. The beginning of the main essay analysing Abbott & Cordova will, therefore, start with the object itself. I will list and discuss the formal elements employed in the work, paying particular attention to how line, light, colour and shape are used in the final composition. The way the gaze is drawn around the image, what the eye is attracted to, what we look at, is very important in the way the viewer finds meaning in the image. The gaze is attracted most powerfully to a place in the image where light is brightest and which all the lines lead toward. This space on the pictorial plane is also empty. Many questions are raised by a close reading of the formal elements of the work. Theory, and theoretical frameworks, will help to answer some, but not all of these questions and will help to unpack some of the meaning implied by the artist as well as some of the meaning the viewer generates when looking at and thinking about Abbott & Cordova, 7 August 1971. Stan Douglas is an internationally renowned photographer, film and video artist. Douglas was born in 1960 in Vancouver, where he currently lives and works and he was educated at the Emily Carr University of Art and Design in Vancouver graduating in 1982. Douglas has had studios in the Downtown Eastside of Vancouver for many years so he is aware of the history of the neighbourhood. Douglas' work reflects the technical and social aspects of mass media and is also generally concerned with concepts of modernism and a continued interest in failed utopias and obsolete technologies as well as media forms that are approaching obsolescence. Abbott & Cordova, 7 August 1971 is Douglas' first large scale use of digital photography.